The conjunction fallacy explains why fake news is believable. This fallacy warns that stories with more facts sound more believable, even though they’re actually less probable. Photo illustration by Slate. Image by IconicBestiary/Thinkstock. Imagine there are 100 toy blocks in front of a toddler. Each of the blocks costs $1, 50 of them are red, 50 blue, and to build a sturdy little house requires about 75 or so blocks. By necessity the house will contain blocks of both colors—even if the child is partial to one of the colors. Now imagine a new manufacturing technology comes along and makes it possible to make these blocks for 1 cent each. Parents can now buy sets of 10,000 blocks, 5,000 red ones and 5,000 blue ones for the same amount of money. 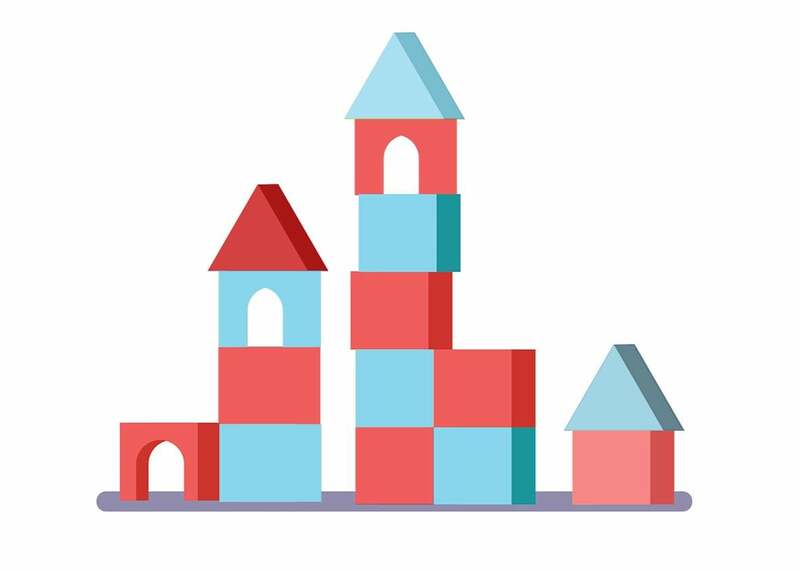 The toddler again makes his or her house, but if partial to one of the colors, he or she can easily find 75 blocks of the same color and make an all red house, or an all blue house, or a monstrosity of a mansion. The new technology is the internet. The red and blue blocks are news stories, colored according to whichever world view they represent, and the houses are meta-stories we toddlers tell ourselves. Thanks to the vast amount of information (or misinformation) on the internet, we are all able to build houses of just one color. Nowadays, we can all easily be misguided by confirmation bias, our natural tendency to search for information that confirms our beliefs and to ignore that which threatens our beliefs. The consequence, if we don’t check our unexamined predilections, is a world that is made entirely of single-colored houses, some red, some blue. And too many single-colored neighborhoods can lead to skewed beliefs. Germane, of course, is the “Pizzagate” story. The rumor that Hillary Clinton and some of her top aides were involved in child-trafficking, among other crimes, grew out of a good number of details that some partisans cobbled together because they were so wedded to their preferred color of block, red in this case. These details were fabricated. It was a fake story. Confirmation bias, however, is not the only cognitive foible that makes fake news stories such as “Pizzagate” more likely. Another is the conjunction fallacy, which suggests a related pitfall of fake news. The conjunction fallacy posits that we are more susceptible to believing untrue stories if they are more elaborate and specific. The more details there are in a news story (especially one, say about the nefarious connection of Clinton to a certain pizza parlor, secret code words, John Podesta, other stores and tunnels, etcetera), the more plausible and engaging the account might become, albeit less probable. Let me illustrate with a less extreme example. Consider the fictitious Sen. Smith, a happily married family man extremely devoted to his son and daughter who lives modestly in his small hometown. Which is more likely: (a) Smith accepted an illegal campaign contribution from a supporter or (b) Smith accepted an illegal campaign contribution from a supporter and used it to pay for his daughter’s expensive medical treatments in a distant city? The second story sounds more likely, because it sounds like there’s a more coherent story being fleshed out, but despite that, the first alternative is more likely. The reason: For any statements A, B, and C, the probability A is true is always greater than the probability that A, B, and C are all true since whenever A, B, and C are true, so is A, but not vice versa. There is sometimes a trade-off between plausibility and probability. The problem is that the abundance of blocks, red or blue, makes it very easy to string together stories supporting A, B, and C. The internet makes readily accessible vast numbers of marginally relevant or manifestly false details about almost everything and everybody (probably even including the fictitious Sen. Smith). Because of this, confirmation bias and the conjunction fallacy are very easy traps to fall into. Untrue stories are believable not only because of our partisanship and our confirmation bias, but also because of the proliferation of information on the internet. Anyone can now pick and choose from the internet’s vast trove of “facts” to colorfully embellish a simple story and make it superficially plausible. We have to be more scrupulous in how we choose our blocks and how we string them together into houses. We have to be smarter and more judicious than we’ve shown ourselves to be if we want to stop our own preferences from trapping us in windowless houses of our own making.